Honor Guard Jackets by J. Higgins, Ltd.
A very versatile jacket for Police Departments. Our Class A Honor Guard jacket comes with blue trim collars and epaulettes, two front pockets, two inside pockets, two belt hooks and easy-to-remove buttons. Standard buttons are our chrome thistle buttons, but you can even send us your department buttons and we'll put them on. You can also order without buttons and put yours on using our sleeve access for easy mounting. This doublet has become very popular mainly due to its attractive price and clean look. The honor guard kilt jacket looks classy and is just the right weight for year-round wear. It will be easy to wear cotton undershirts or poly winter shirts. It is very comfortable and allows a piper easy movement. A real value for the price!!!! Jacket looks awesome! Very Sharp. The fit is a little snug, but otherwise a great investment. Quality and cost effective. Highly recomend. 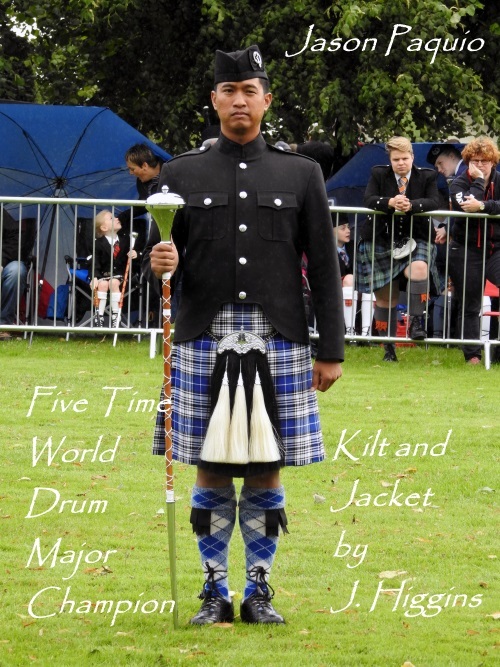 Excellent product and customer service, I highly recommend this Honor Guard coat for police pipe bands. Very good quality with Thin Blue Line trim.